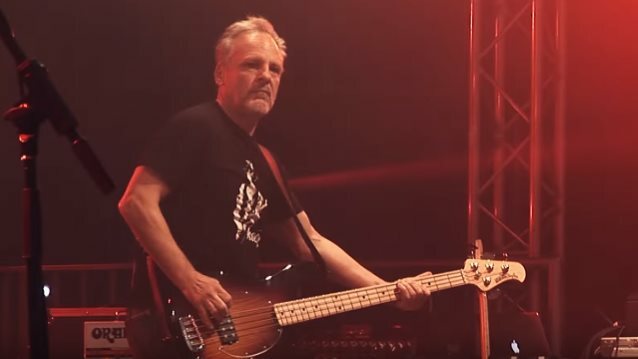 Mark Evans, who played bass for AC/DC from 1975 until 1977, has joined fellow legendary Australian hard rockers ROSE TATTOO. News of the 61-year-old musician's addition to ROSE TATTOO's lineup was broken in a Facebook post by another new member, former ANGELS guitarist Bob Spencer. Joining Evans and Spencer in ROSE TATTOO's current incarnation are former AUSTRALIAN CRAWL drummer John Watson, Dai Pritchard — the band's guitarist for the past decade — and frontman Angry Anderson. "How's this for a band? Dai Pritchard, Mark Evans, John 'Watto' Watson, Angry, Moi. Meet the new ROSE TATTOO," Spencer wrote. Anderson, Evans and Pritchard recently played together in the band BLOOD, SWEAT & BEERS, a touring outfit put together in celebration of the music featured in writer Murray Engleheart's Australian rock history book of the same name. Evans joined AC/DC in 1975 and remained with them through their barroom days, their first international tours, and the majority of the Bon Scott-era albums: "High Voltage", "Dirty Deeds Done Dirty Cheap", "T.N.T. ", "Let There Be Rock", and the U.S.-only '74 "Jailbreak" collection — recordings that have since sold in excess of ten million copies in the U.S. alone. Although Evans's tenure in AC/DC was short-lived, it was during a pivotal point in the band's development. "We were really honing the classic AC/DC sound," he told Music Radar. "The steady, pounding rhythms; the hard-edged, twin-guitar attack; the in-your-face vocals — it was all right there. It wasn't anything fancy, but it was honest. It was something everyone could relate to." Evans in 2011 released his memoir, "Dirty Deeds: My Life Inside/Outside Of AC/DC". How's this for a band? Meet the new Rose Tattoo.